Symantec, however, held out on AV-Comparatives again. 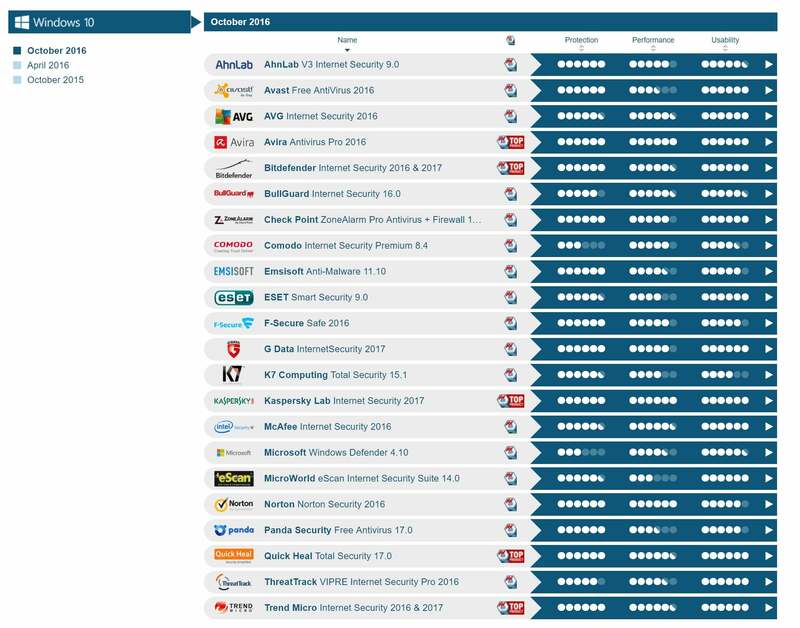 The two major independent antivirus testing houses have completed their assessments of the best antivirus products for 2016, and the results are in: Norton by Symantec came out on top in one test, and Avira in the other. AV-Comparatives released its best antimalware product of 2016 on Tuesday, after AV-Test announced its choice last week. There was the usual dash of controversy, however, as Symantec again declined to submit its Norton product to AV-Comparatives for testing. Otherwise, the winners were clear: AV-Test anointed Norton Security 2016 as providing the best Protection of all consumer antimalware products it tested during 2016. AV-Comparatives named Avira Antivirus Pro 2016 as its best antimalware product of 2016, narrowly edging out Bitdefender and Kaspersky. Why this matters: No average user wants to venture into the dark recesses of the Web, let alone try to capture the malware that lurks there for product testing. Specialized testing houses do do this, however, with the idea that testing a PC’s defenses is better done in the laboratory than on your machine. You certainly don’t have to take the advice of AV-Test and AV-Comparatives as gospel. Factors like pricing and how usable each program aren’t considered. But the findings give you a number of options from which to choose. The good news is that of the 19 antivirus vendors who submitted products to AV-Comparatives for testing, all were rated as Approved security products, capable of providing acceptable PC protection. That includes Microsoft’s built-in, free Windows Defender, which AV-Comparatives and other vendors use as a baseline for comparing the other products. AV-Comparatives’ overall test results. One star indicates Standard (acceptable) results, with the other two representing Advanced and Advanced+ scores. Though it selected Avira as Product of the Year, Bitdefender and Kaspersky Lab scored so highly that AV-Comparatives created a new category, Outstanding Products 2016, to honor the other two. Put simply, the agency believes that all three products supply the best protection for your PC. The firm also assigned a Top-rated Products award to those products that finished at or near the top of various categories: Emsisoft, ESET, Tencent, and ThreatTrack VIPRE. In considering its awards, AV-Comparatives looked at five different aspects of protection: detecting actual malware, as well as not flagging legitimate software as malware; removing the malware; and how much of an impact protection and removal had on your PC. The fifth test simply looked at how well each product did in the real world (using known malicious URLs), rather than a laboratory. AV-Comparatives also broke down the winners by category, allowing you to parse which antivirus product to buy based upon what’s important to you. We’d suggest the Real-world Protection Tests, whose top award went to Bitdefender and its 99.9-percent malware block rate. Note, though, that other vendors do just as well in blocking malware—Trend Micro, for example, also blocked 99.9 percent of all tested malware samples. AV-Comparatives didn’t rate them as favorably, however, due to the relatively high number of false positives—legitimate software detected as malware. In that case, Trend Micro reported 67 false positives, while BitDefender reported zero. Each of those 67 cases would have required your manual intervention to “whitelist” the innocent software. That fact that Symantec was once again excluded from AV-Comparatives’ testing isn’t unusual. Since 2012, Symantec has refused to submit its code to AV-Comparatives. Though Symantec didn’t offer PCWorld a statement by press time, the company told users in 2012 that AV-Comparatives didn’t offer a test that evaluated Norton’s real-world protection capabilities. “Our philosophy is to participate in tests that have high relevance and meaning for consumers, and most accurately align with their real-world need for comprehensive protection and machine cleanup from evolving online threats,” the company said then. For its part, AV-Test highlighted the best products in various categories. AV-Test awarded Norton the crown with its Best Protection award for consumers, but singled out Kaspersky for its Best Performance award and Best Usability awards. Avira, however, was named as the Best Repair Software if your PC is already infected. AV-test also published a more granular look at its findings on its website. In Windows 10, for example, the firm found that Avira, Bitdefender, Kaspersky, Quick Heal, and Trend Micro offered the best protection. The firm even tested antimalware on older operating systems, including Windows 7. AV-Test.org’s ratings for various antimalware products under Windows 10. Note that you can drill down for more detailed findings within each product on AV-Test’s site. With literally dozens of antivirus products to choose from, it can be a struggle to figure out which will actually secure your PC. It’s also a moving target: Malware evolves, and so do the methods to combat it. But if you want to know what the best antimalware software is out there right now, this is one of the few times that question can be answered pretty definitively.